Members of the Steering Committee, Community Ambassadors, and Neighborhood Liaisons are chosen to represent the broadest spectrum of views and expertise possible within the Village. They include designees of every neighborhood as well as representatives of different Village departments that touch different aspects of the lives of South Orange residents. Each is trusted to be a friendly, curious and honest caretaker of the community’s voice to ensure it is embodied within the final Master Plan document. 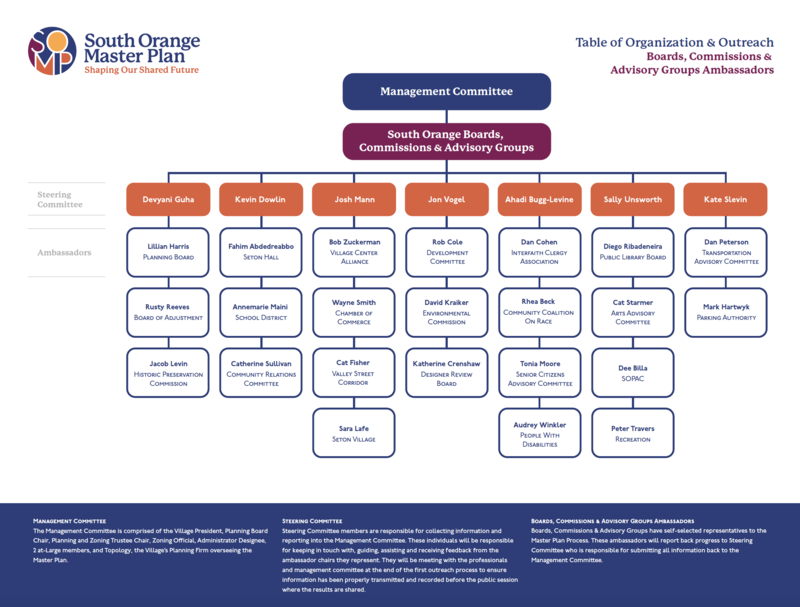 The Management Committee is comprised of the Village President, Planning Board Chair, Planning and Zoning Trustee Chair, Zoning Official, Administrator Designee, 2 at-Large members,and Topology, the Village’s Planning Firm overseeing the Master Plan. Steering Committee members are responsible for collecting information and reporting into the Management Committee. These individuals will be responsible for keeping in touch with, guiding, assisting and receiving feedback from the ambassador chairs they represent. They will be meeting with the professionals and management committee at the end of the first outreach process to ensure information has been properly transmitted and recorded before the public session where the results are shared. 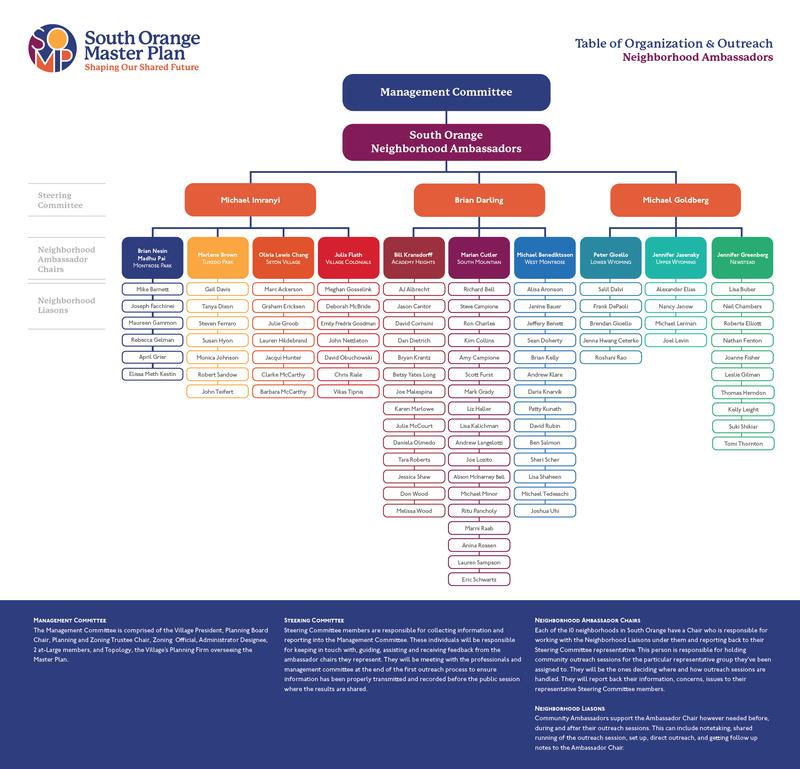 Boards, Commissions & Advisory Groups have self-selected representatives to the Master Plan Process. These ambassadors will report back progress to Steering Committee who is responsible for submitting all information back to the Management Committee. Each of the 10 neighborhoods in South Orange have a Chair who is responsible for working with the Neighborhood Liaisons under them and reporting back to their Steering Committee representative. This person is responsible for holding community outreach sessions for the particular representative group they’ve been assigned to. They will be the ones deciding where, where and how outreach sessions are handled. They will report back their information, concerns, issues to their representative Steering Committee members. Community Ambassadors support the Ambassador Chair however needed before, during and after their outreach sessions. This can include notetaking, shared running of the outreach session, set up, direct outreach, and getting follow up notes to the Ambassador Chair.